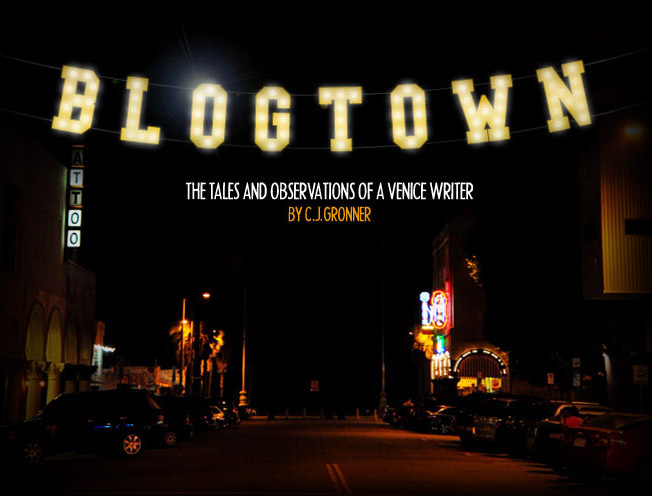 Blogtown: The Venice Art Crawl Turns 3! The Venice Art Crawl Turns 3! The Venice Art Crawl turned three with a fun party to celebrate last Friday. Time flies, man. I remember the very first one well - three years ago already?! - as one of the most blast nights ever. As was Friday, with Venizens showing up to party in the street, like the good old days. Speedway and Dudley was the street party, with one half of the jamboree happening at The Cadillac Hotel and the other half across the street in the old Henry's Market (newly gone) at 9 Dudley. It was great to have art in the space again, as we spent many MANY a good time in the old Sponto Gallery located right next door. Sponto himself would have LOVED to see so many good Venice people out having a good time on a beautiful summer evening on Dudley. Music blasted so loud you couldn't really talk that great, so you just smiled, hugged and looked at the art and the people who make and appreciate it. Artists donated pieces to be hung/sold. Several local restaurants donated food and drink. Many volunteers donated their time and hard work. Organizers (Edizen! Nicole! Sunny! Danny S!) broke their backs securing all of the above, and it was well worth it, to judge by the grand old time people were having. It's all about Venice, and all about the art that is created and shown off here. The next Art Crawl will be September 19, and there's a lot of good stuff in store. Mark your calendars to get out to it and see what all the fun is about as the Venice Art Crawl kicks off it's fourth year. Happy Birthday, VAC!!! .... AND MANY MORE!!!! Would love to get to one of those events!! Sounds like it was fun! Happy Birthday0 VAC!! Lollapalooza 2013 - Day Three! Lollapalooza 2013 - Day Two! Lollapalooza 2013 - Day One!